The flow-induced deformation of liquid capsules enclosed by elastic membranes is discussed with reference to the biofluid-dynamics of vesicles and biological cells. The deformation of a membrane from a reference configuration causes the development of non-isotropic in-plane elastic tensions, transverse shear tensions, and bending moments according to constitutive laws that reflect the membrane constitution. The type and degree of capsule deformation, the internal and external structure of the flow, and the macroscopic rheological properties of a suspension are determined by the magnitude of the developing elastic tensions and bending moments relative to the strength of the imposed flow. 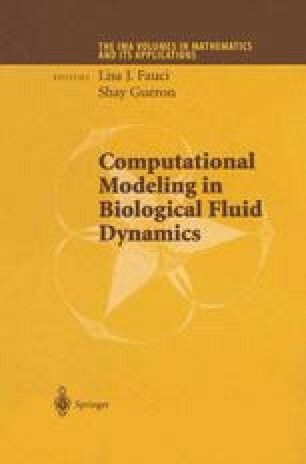 Integral representations of the flow past a collection of capsules are reviewed, and integral equations for the velocity distribution over the membranes are presented for two-dimensional, three-dimensional, and axisymmetric flow at vanishing Reynolds number. The velocity field due to the presence of the capsules is expressed in terms of distributions of Stokes flow singularities over the membranes, represented by the single-layer and double-layer hydrodynamic potential of Stokes flow. The strength of the distribution of the single-layer potential expressing interfacial distributions of point forces is identified with jump in the hydrodynamic traction across a membrane. Expressions for this jump are reviewed and derived in terms of the developing elastic tensions and bending moments under the formalism of the theory of thin shells.